Thanks for a GREAT 2018/19 Season!! We were delighted to have our “magic carpet” up and running for the third season. What’s a “magic carpet” you ask? Simply put a conveyor belt that allows our new or learning ski/boarders an easy way to get up the hill. Just step on the belt and up to go. No handles or seats required. It is a great new addition to our learn to ski program. Come and check it out. A metal bar, either rounded or with a small flat surface, which a skier or snowboarder can slide across (called “jibbing”). Rails are defined as anything too thin for a skier to place both skis on without turning. Many people confuse rails with wider surfaces with boxes, however these are not, and are just rails with a little UHMWPE on top. Similar to a box, but much wider. Commonly used by beginners who want to become comfortable with box type surfaces before moving on to real boxes. Table Tops are very wide and therefore allow a skier or snowboarder to slide across the surface and is difficult to fall on. Similar to a rail, but wider with an ultra high molecular weight polyethylene (UHMWPE) surface. May or may not have metal edges. Many jib features resemble outdoor items used when snowboarding in urban areas, such as stair handrails, benches, tables, etc. Used as natural surfaces and can be found either on or off the trails. Rails and boxes have many different shapes and sizes: straight, sloped, curved (often called a “Rainbow”), or kinked. Rails, especially rainbow, will also be seen curving over obstacles or vehicles. All lift ticket prices are subject to HST. We do not offer refunds based on weather and/or snow conditions. Children 6 and under are FREE with the purchase of a family pass (proof of age is required). All season pass prices are subject to HST. Refund policy applies. Season passes must be picked up in person at the resort. All equipment rentals are subject to HST. No refunds. Seasonal Lockers $249 plus $20 refundable lock deposit. Dimensions: 15”Wx18”Dx72”H. Will hold 6 pairs of skis with poles or 4 snowboards. Ski & Snowboard lessons – Saturday, Sunday and Holiday’s @ 9:45, 11:00, 12:30 & 2:00. Subject to availability. Lift pass not included. Refund policy applies. Improve your skiing or snowboarding skills with one of our experienced and certified instructors. Lessons available for all abilities. Come check out our Riglet Park, an exclusive terrain based learning area for kids aged 3 years and older featuring small hills, rollers, obstacles and boxes – Perfect for introducing your child to the sport of Snowboarding. With Burton’s revolutionary Riglet Board and Reel, learning is safe, fun and interactive for even the youngest winter enthusiasts! The Riglet lesson package includes a 45 minute one-on-one lesson with one of our experienced and enthusiastic instructors, Riglet board and helmet for duration of the lesson and access to the Riglet Park. A great way to get introduced to the sport of skiing or snowboarding at a great price! Group lesson with one of our experienced and certified instructors to teach you the basics and will have you enjoying the slopes safely before you know it! Upgrade to a Full-day ticked for only $19.99! MAKE THE MOST OF THE WINTER WITH OUR 7 WEEK INSTRUCTIONAL PROGRAMS!! Must be 4 years of age as of December 31, 2019. Must be 6 years of age as of December 31, 2019. Must be 8 years of age as of December 31, 2019. Official proud partner of RIDERS, The Canada Snowboard RIDERS Program is a confidence-building and skills-oriented introduction for young athletes to the sport of competitive snowboarding. The focus of the eight to twelve week program is on developing the fundamentals required to excel in the sport’s multiple disciplines. Four day camps, with 2 hours of instruction per day, to help you get to your next skiing or riding goal. Helmets are mandatory. Lift ticket is included in the price of the camp. $674 before April 14th. Regular $774. The House League race program is a non-competitive, introductory racing program for novice and intermediate skiers. The program provides 4 hours of training and instruction per day for 8 consecutive weeks. Participants must be able to ride the chair lift unassisted and be comfortable turning and stopping on Blue Terrain. Must be 8 years of age as of December 31, 2019. Proof may be required. $1174 before April 14th. Regular $1374. The travelling race program is a 9-week competitive training program for athletes ages 8-13 (U10, U12 & U14). Participants compete in a minimum of 4 races at other ski clubs in southern Ontario as part of Alpine Ontario – SOD CUP Circuit (Division 2). Participants must register with Alpine Ontario, fees are not included. 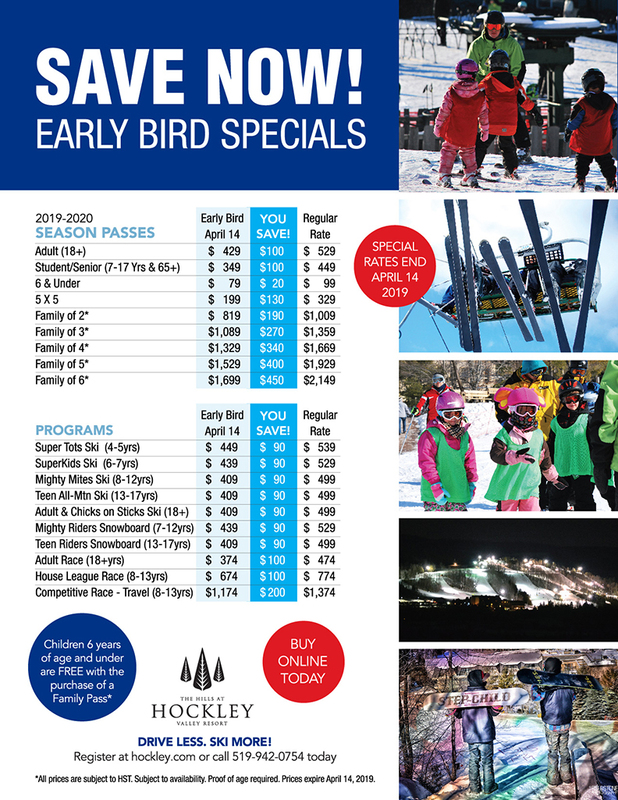 Register at www.alpineontario.ca. Must be 8 years of age as of December 31, 2019. Protective equipment required. A fun and social environment for adults wanting to engage in non-competitive race training. Speed suits are not permitted. A three day camp, with 4 hours of on-snow coaching per day, designed to prepare athletes for the first races of the season! Recommended for all athletes registered in the competitive race program. Helmets are mandatory, valid lift pass required. Must be registered in the House League or Competitive race program. For all race programs, helmets are mandatory and a valid lift pass is required. Are you interested in becoming an instructor one day? Apply now to be an apprentice ski or snowboard instructor for the upcoming 2020 season. This is a great way to get valuable experience teaching and assisting experienced instructors with our ski and snowboard programs. Hockley Valley Resort offers a great learning environment to skiers and snowboarders of all abilities. Our newly improved beginner learning area with Magic Carpet, and staffed by our team of experienced instructors will have your beginner skiers and boarders moving and enjoying the freedom of sliding in no time! Lessons are often held in less than perfect weather and refunds and credits are not issued for snow and/or weather conditions. Refunds or credits will not be issued to participants who miss a class or lesson (program or private) for any reason after the start of the season. We are unable to change the day or time of a private lesson or program, and participant after the start of the season. A Hockley Valley Resort lift pass is required when riding the slopes at Hockley Valley Resort. Patrons are not permitted to walk on the slopes without participating in either skiing or snowboarding and bearing a lift ticket or season pass. Although you may want to walk the slopes to help your children learn to ski or board, your safety and the safety of others is our ultimate concern. If you would like to assist your children in learning, we recommend enrolling them in a private lesson or in a 4-week or 8-week lesson program. Tobogganing is prohibited anywhere on Hockley Valley Resort property. The possession of alcohol is prohibited outside of licensed areas. As part of our Safety Education Program, members of HVR Ski Management/Supervisors have been authorized to remove the Lift Ticket or Season Pass from anyone who fails to adhere to the Alpine Responsibility Code after being warned to do so. HVR Ski Management/Supervisors have also been authorized to remove a Lift Ticket or Season Pass without warning for the misuse of any Lift or Elevating Device, tampering with any Safety Equipment, any abusive conduct and the consumption of Alcohol or Illegal Drugs.